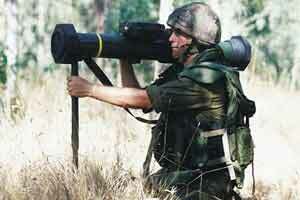 SHIPON is a cost-effective weapon system that was developed in the late 1990's, designed to bridge the gap between low-cost men-served LAR's (Light Anti-Tank Rockets), such as the M-72 LAW, and expensive crew-served ATGM'S (Anti-Tank Guided Missiles), such as the TOW. The Shipon provides a single infantry soldier with the capability to engage and defeat all modern enemy MBT'S (Main Battle Tanks), including such protected by ERA (Explosive Reactive Armor). In addition, it can be effectively used against various types of targets such as bunkers, armored or non-armored vehicles and different kinds of fortifications. 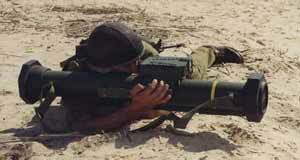 The rocket has penetration capabilities similar to these of 2nd and 3rd generation ATGM'S, while it's as cost-effective and simple to handle as a LAR (a single soldier can carry and operate the system by himself). Moreover, advanced FCS (fire control system) and dual stage propulsion enables the operator to engage targets as far as 600 meters away from him with a 50% hit probability. Outstanding versatility is provided by two dedicated dual mode warheads. 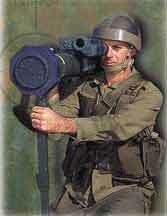 Penetrates 800 mm of armored steel (reactive armor protected), or 500 mm of reinforced concrete. In anti-fortification mode, front charge penetrates reinforced concrete and main charge explodes inside structure. In anti-personnel mode, front and rear fragmentation charges separate at optimal height and explode above target.